'Game Of Thrones' Season 6 - Have The Lannisters Lost Their Roar? Without Game Of Thrones' Tywin Lannister to lead them, is this the beginning of the end for the mighty lions? So, this week's Game of Thrones, "Blood Of My Blood", was the first episode of the season where no blood was actually spilled! In an episode of family reunions and home troubles, we got an hour long soap opera. We had the winners - go team Stark, but we also had some losers - boo team Lannister. Arya's holiday in Bravos saw the return of the acting troupe, and whilst it was amazing to see the superb Richard E. Grant as a farting Tywin Lannister, slain on the toilet, it also highlighted what a laughing stock the fabled family have become. Looking at the family tree, there aren't exactly a lot of Lannisters still knocking around Westerors. They seem to be failing at everything they do recently and aren't even allowed to sit with the cool kids at the small council meetings. Without Tywin Lannister to lead them, is this the beginning of the end for the mighty lions? The High Sparrow eyes another target. Jaime confronts a hero. Arya makes a plan. The North is reminded. Breaking it down, we already know that the High Sparrow hates Cersei, so we are speculating that he will turn his attention to another Lannister, Ser Kevan to be accurate. Kevan Lannister, the former Master of War and current Hand of the King, is now the most powerful man in King's Landing - not to mention the fact that his son Lancel is one of those surly sparrows. With Kevan out of the way, the High Sparrow can ascend to Hand of the King and tighten his grip on the capitol. With a track record of death in that role, why would anyone want that job anyway? My character is an ex-warrior who’s become a peacenik… I bring back a much-loved character everybody thinks is dead. It is no secret that the 'deceased' Rory McCann has been spotted on set for this season. For those who don't remember, McCann plays Sandor Clegane, the chicken loving scarface, who is brother to The Mountain. With The Hound back, and under the tutelage of the Faith, now is the perfect time for the brothers to face-off. Quite how and why the showrunners would bring The Hound back reamins puzzling. In the books it is Brienne of Tarth who meets Meribald on the Quiet Isle, but with her loved up with Tormund Giantsbane, someone else will have to meet McShane's character. If Cleganebowl really does take place, it is sure to settle some old scores. After the epic trial by combat in Season 4, we can't see The Mountain making it two for two - he's going to be leaving the ring in a bodybag (again). Emphasis on the 'yet' in that one. Looking at the promo, there doesn't seem to be much fighting going on between Jaime and Brynden. Considering you are attempting to take back a castle, I doubt you would be face to face without bloodshed. We know that Jon Snow's Northern rebellion is leading to the epic 'Battle of the Bastards', where Jon's armies face off against the Bolton forces. The Tully forces are sure to align with the Starks on this one, but then where does Jaime go? Losing another hand and limping back to his sister? We think not! Bear with us on this one, but what if the reformed Kingslayer, Jaime Lannister, turned team Stark. Whilst set pictures from that upcoming battle show most of the big players, (including Sansa and Davos) a surprise appearance of Jaime could be the icing on the cake for fans. He technically does owe the Starks, considering Caetlyn freed him, and Jaime wouldn't be the first Lannister to show mercy to the downtrodden Starks - we already saw Tyrion Lannister help out Sansa. Our two ancient houses face collapse, due to your stupidity. Any scene with Diana Rigg and Lena Headey deserves an episode of its own, but Lady Olenna puts it quite bluntly. Two of Westeros's most powerful houses aint what they used to be, and without House Martell, the Lannisters would have nothing left. After Tommen's impending death, (surely this is soon) don't expect the Queen of Thorns to stick around much longer. We will see Olenna pack off back to High Garden with Margaery, Loras and Mace in tow, leaving Cersei to mop up the mess left behind. In a season full of death, the odds are ever increasing that another Lannister will be bowing out before we wave goodbye this year. The end is nigh, and we all know that it won't be a Lannister sitting on the Iron Throne by the end of the epic saga, so where does the house go? A craaaazy fan theory has started circling due to Kit Harington and his big mouth. In an interview with Heat Magazine, the Jon Snow actor played a game of shag/marry/kill - firstly opting to marry the obvious choice, Daenerys Targaryen, but then throwing us all a curveball. Marry Daenerys. No, actually [I] wouldn't. No. Marry..ummm..marry Cersei. I would let people think that one through. Gold shall be their crowns and gold their shrouds. And when your tears have drowned you, the valonqar shall wrap his hands about your pale white throat and choke the life from you. We have already seen Joffrey and Myrcella bite the dust and Tommen can't be long for this world, but it is the second half which spells trouble. Valonqar means 'little brother', leaving many to speculate that 'little' Tyrion Lannister will be the one to finish Cersei off. With Tyrion now firmly on the side of Queen Daenerys and her (eventually) heading to King's Landing, we must be heading for a final Cersei/Tyrion showdown - we already know that he is fond of choking people to death, so why change the habit of a lifetime? 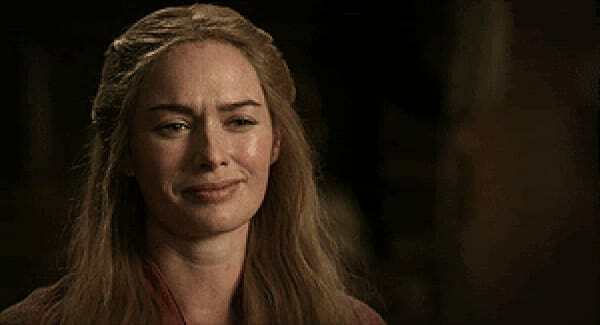 Best case senario and the prophecy is wrong, then what else would be left for the former Queen Regent? Will we be left with a lonely Cersei walking around Westeros for the rest of her days, or will she row off into the distance like Gendry? We will have to wait and see, but the lions aren't kings of the jungle anymore! Read next: New Footage Means We Are One Step Closer To HBO's Westworld! New Footage Means We Are One Step Closer To HBO's Westworld!